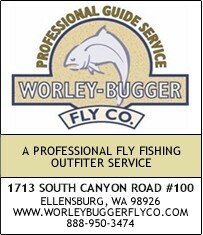 The guide staff of Worley Bugger Fly Co. has developed another innovative fly tying session called Yakima River 365. This class is designed specifically for the Yakima River Fly Fishing enthusiast. It is a complete class tailored to teach each student the flies used to imitate each major insect hatch that occurs on the river throughout the entire fly fishing season. You will learn the steps to tie all phases of each stonefly, mayfly and caddisfly event that occur during the year on the Yakima as well as terrestrial and baitfish streamer patterns. We’ll also spend time discussing the hatches, how to correctly identify and fish them successfully from a professional Yakima River guides point of view. The Yakima River 365 consists of 7 session that will be held twice a week at the Worley Bugger Pro Shop in Ellensburg. Each session last 2+ hours and is held on Tuesday and Thursday evenings from 6:30 pm to 8:30 pm. A question and answer period to follow each evening. The cost is $150.00 per student. To register, please call or email the pro-shop.